A statewide point dataset containing the approximate location of oil and/or hazardous material disposal sites that have been (1) reported and (2) Tier Classified under M.G.L. Chapter 21E and the Massachusetts Contingency Plan (MCP). Location types featured in this datalayer include the approximate center of a site, the center of a building on the property where the release occurred, the source of contamination, or the location of an on-site monitoring well. For the purposes of this document, the terms “MassDEP Tier Classified oil and/or hazardous material disposal sites” and “Tier Classified Chapter 21E sites” are synonymous and are often referred to simply as “sites”. The layer is named C21E_PT. Releases of oil and/or hazardous materials are reported to the Massachusetts Department of Environmental Protection’s (MassDEP) Bureau of Waste Site Cleanup (BWSC), according to procedures established in the MCP (310 CMR 40.0000). The sites mapped in this datalayer represent only a subset of the total reported Chapter 21E sites tracked by MassDEP BWSC. Chapter 21E sites that have not yet been Tier Classified are not contained in this datalayer. Under Massachusetts’ Waste Site Cleanup Program, which is a largely privatized program, data maintained by the MassDEP regarding site location are provided to MassDEP BWSC by Responsible Parties (RP), Potentially Responsible Parties (PRPs) and by Licensed Site Professionals (LSP), hired by the RP or PRP to conduct cleanup at a site. Location data is provided in a paper format (e.g., map and textual information) and maintained by MassDEP BWSC in individual site files. 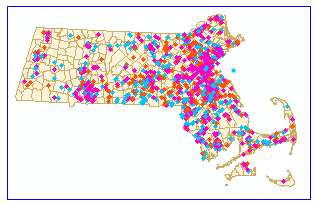 These site files are available to the public through the MassDEP’s Regional Offices. Anyone wishing to view Chapter 21E site files can make arrangements with the regional offices though a Freedom of Information request. MassDEP encourages persons to review these site files when they make decisions that consider a specific site. Most of the site locations included in the MassDEP Tier Classified Oil and/or Hazardous Material Sites datalayer are interpretations of data provided by PRPs and LSPS converted to a digital format by MassDEP staff. These data have not been field-verified. In some cases where file information was inadequate or unavailable, locations were provided by MassDEP technical staff through knowledge gained in the course of their professional activities. The rules requiring notification, assessment and remediation of releases of oil and hazardous materials are codified in the Massachusetts Contingency Plan (MCP) 310 CMR 40.0000. Under the MCP and M.G.L. Chapter 21E, the PRPs are responsible for the timely assessment and cleanup of disposal sites in Massachusetts. The MassDEP BWSC is required to audit PRP response actions performed on 20% of the sites and when necessary provides direct agency oversight of cleanup efforts. If permanent cleanup is not achieved for a disposal site within a year of being reported to MassDEP, the site must be classified as Tier I or II based on a variety of factors, including the site’s complexity, the type of contamination, and the potential for human or environmental exposure to the contamination. In addition, some sites are automatically given a Tier I classification if they pose an imminent hazard or affect public water supplies. A site’s Tier Classification determines the level of MassDEP oversight. Tier I sites require a permit and sites, and the most complicated sites, require direct MassDEP BWSC oversight. Many of the locations in this datalayer are based on information provided by the RP, PRP or their LSP. Locations in this datalayer should ONLY be considered as an ”approximation” or “best estimate” based on the information submitted to the MassDEP BWSC. The accuracy and completeness of the information submitted has not been verified by MassDEP. There are other Chapter 21E sites in Massachusetts that are not contained in this datalayer. For example, this datalayer does not include (1) contaminated sites that have not been reported to MassDEP or (2) sites for which a Response Action Outcome (RAO) has been submitted to MassDEP. Furthermore, not all Tier Classified Chapter 21E sites may have been located. Please refer to the associated Unlocated Sites List (C21E_PT_USL) for a current list of unmapped Tier Classified Chapter 21E sites. Tier Classified Chapter 21E site data are extremely temporal. Although the datalayer is updated on a regular basis, it will never be complete or up-to-date. Users should check MassDEP BWSC site files (at the appropriate MassDEP Regional Office) for the most current information. MassDEP recognizes that point features are not the ideal spatial model for representing contaminated areas, especially in the case of large sites or if considerable contaminant migration has occurred. Due to the limitations of the information that PRPs and LSPs are currently required to submit to MassDEP, the spatial representation of sites as point features is currently the only realistic method for generating Tier Classified Chapter 21E site data on a statewide scale. Point locations representing Tier Classified Chapter 21E sites in this datalayer have not been field-verified and should be considered approximate. Locations were derived through review and interpretation of paper maps and textual information contained in MassDEP BWSC site files, which are maintained in MassDEP’s Regional Offices. Generally, such information was submitted to MassDEP by potentially responsible parties (PRPs) and the PRPs’ licensed site professionals (LSPs). Please be advised that this datalayer is incomplete. MassDEP has been unable to locate some sites due to inadequate source material. Sites that are not yet reported or tier-classified are not mapped, nor are sites for which a Response Action Outcome (RAO) has been submitted to MassDEP. Site contamination may extend well away from the point representing a site on this map. The MassDEP BWSC site files should be reviewed for the most accurate and up-to-date information about a particular site. While the Tier Classified Chapter 21E site data shown on this map provides some useful information, the user should be aware of the data’s limitations. 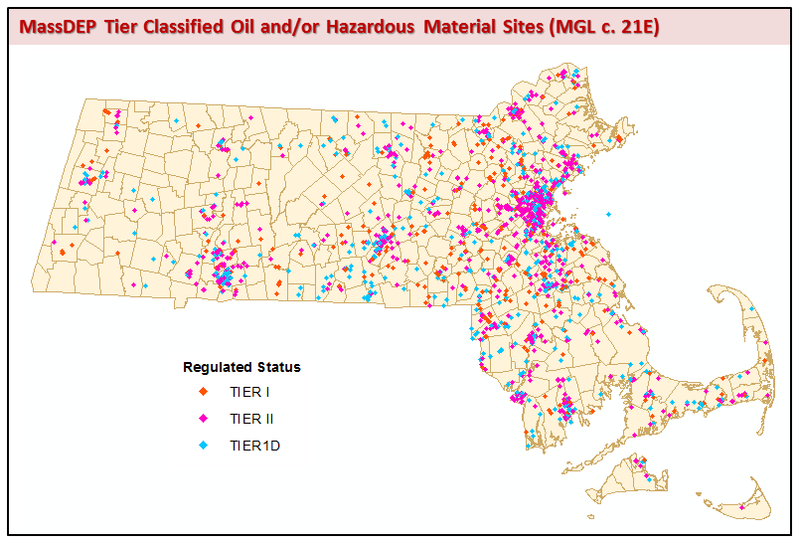 For further information, please consult the datalayer description documentation of MassDEP Tier Classified Oil and/or Hazardous Material Sites, available on the MassGIS Web Site: https://docs.digital.mass.gov/dataset/massgis-data-massdep-tier-classified-oil-andor-hazardous-material-sites-mgl-c-21e. Questions regarding Tier Classified Chapter 21E site data on this map may be referred to the MassDEP GIS Program (617) 574-6856. MassDEP BWSC is responsible for providing the MassDEP GIS Program with a comprehensive listing of Tier Classified Chapter 21E sites, including street address information and unverified coordinate data. A “development coverage” was created from this data using address matched and coordinate-generated data. Chapter 21E site files maintained by MassDEP contain a variety of types and qualities of maps, including surveys, site plans and locus maps. MassDEP GIS Program staff reviewed this file information and identified the best manuscript maps and supplemental text information for locating sites. In limited cases, textual manuscripts, contained in the site files, provided sufficient descriptive information for estimating site locations. To facilitate conversion of paper data to a digital format, the MassDEP GIS Program created the Point Development Tool (PDT), a customized application using ESRI’s ArcView software (the PDT application is available as an extension to the MassGIS DataViewer). The PDT provides a standardized platform that guides users through the automation and documentation of geographically-referenced point data. On-screen digitizing using the PDT and the best available manuscript map information was the primary method of automation. In situations where manuscript maps and other source information from the file record were inadequate or unavailable, MassDEP technical staff were asked to help locate the site based on knowledge gained in the course of their professional activities involving that site. Using data in the “development coverage,” the PDT navigates data developers to the general vicinity of a site. The PDT then displays the best digital base imagery available for that vicinity. The PDT uses MassGIS 1 meter (1:5,000) black and white digital orthophoto images (DOQ) as the default basemap. Where 1 meter B&W 1:5,000 DOQs were not available, the PDT defaulted to 1 meter USGS (1:12,000) black and white digital orthophoto images or USGS (1:25,000) topographic quadrangle images, respectively. When data development began, the only available digital basemap imagery for much of Massachusetts was the MassGIS scanned USGS (1:25,000) topographic images. Therefore, the base scale of this datalayer is considered to be 1:25,000. The PDT currently uses MassGIS color digital orthophotography images as the default statewide basemap. After interpreting the source manuscripts, developers used the PDT to select a point on the base image that best represents the site location. The PDT guided the developer through the data documentation process, recording information about the type of source material, type of feature located, and an assessment of the locational accuracy of the mapped point. NAME Site name assigned by MassDEP BWSC describes the site in terms of its location use or type. General site information attributes are populated using the most current MassDEP BWSC database information available at the time of update. The Release Tracking Number (RTN), is a unique 7-digit site identifier assigned to reportable releases by MassDEP BWSC. This number is preceded by either 1,2,3 or 4 (e.g. 3-0001234) according to the MassDEP region in which the site is located (see:description of MassDEP Region ID below). The name assigned by MassDEP BWSC that best describes the site location. The site name does NOT necessarily reflect the identity of any PRPs. The number and street that most accurately describes the site location; mile markers or similar highway designations may also be used. Current status of the site. Chapter 21E Tier Classification is based on the requirements, standards and procedures set forth in 310 CMR 40.0500 or 40.0600. (d) one or more response actions are required as part of an Immediate Response Action to eliminate or mitigate a Critical Exposure Pathway pursuant to 310 CMR 40.0414(3). (b) the person undertaking response actions is in noncompliance with M.G.L. c. 21E, 310 CMR 40.0000 or any other applicable requirement, and MassDEP reclassifies the disposal site as a Tier ID disposal site pursuant to 310 CMR 40.0583. - TIER II: Any disposal site that is not Tier ID pursuant to 310 CMR 40.0502 or 40.0520(5) and does not meet the Tier I Criteria described at 310 CMR 40.0520(2). Geographic Information Fields are populated using GIS overlay/identity functionality. 1. MassDEP BWSC Downloadable Sites List - This compressed file (RELEASE.ZIP) includes a database file (RELEASE.DBF) containing a record for all reportable releases tracked by the MassDEP BWSC, as well as accompanying documentation (README.DOC). MassDEP BWSC updates this file on a regular schedule. Tablular datasets in RELEASE.ZIP can be related to the AUL datalayer by the RTN. Please note that Oil and/or Hazardous Material Sites with AULs are only a subset of the total reportable releases contained in the MassDEP BWSC Downloadable Sites List. 2. DEP Location Documentation Table (C21E_PT_LDT) - See MassDEP Standards for Point GIS Data. 3. Unlocated Sites Table (C21E_PT_USL) – Contains a list of known, unlocated Tier Classified Oil and Hazardous Materials Sites at the time of publication. The MassDEP GIS Program maintains this datalayer in cooperation with MassDEP BWSC. If you have questions regarding this datalayer, please contact the MassDEP GIS Program at (617) 574-6802 or (617) 574-6856. 2003: In April 145 sites were added and 200 sites (that are no longer Tier Classified) were removed. In July 129 sites were added and 155 sites were removed. In November 543 sites were added, 239 sites were removed and 963 sites underwent Tier Classification changes, including 939 previously Default Tier 1B sites now classified as Tier 1D. In December 58 sites were added, 62 were removed, and 20 underwent changes in regulated status (STATUS). 2004: In January 38 sites were added, 84 were removed, and 10 changes were made to classification. In February, 47 sites were added, 55 were removed, and 6 changes were made to classification. In March 119 sites were removed. In May 26 sites were added, 148 sites were removed, and 12 sites underwent a change in Status. In June 51 sites were added, 89 were removed, and 6 had status changes. In July 29 sites were added, 64 sites were removed, and 17 sites had a change in status. In August 18 sites were added, 80 sites were removed, and 24 sites had a change in status. In September 61 sites were added, 77 were removed, and 10 sites had a change in status. In December 81 sites were added, 117 sites were removed, and five sites underwent changes in Tier Classification STATUS. 2005: In January 15 Tier Classified Sites were added and 236 sites that are no longer Tier Classified have been removed. In March: 111 Sites removed, 59 added. In May: 21 sites added, 109 sites removed. In June 2005: 141 sites added, 154 removed. In August: 131 sites added, 132 RAO (Release Action Outcome) sites removed. RAO sites are release sites that have been cleaned up to MCP standards and are no longer Tier Classified. DEP GIS removes these sites from the C21E_PT featureclass. In October 13 Sites were added and 62 Sites (no longer Tier Classified) were removed. In November 3 sites were added and 73 were removed. 2006: In February 115 sites were added and 217 sites were removed. There were 15 RTN changes due to DEP regional boundary shift in the Western and Central Regions. May: 154 removed, 36 added, 151 RTN changes. June: 122 sites added and 58 removed. The July 2006 update included: 21 sites added and 268 sites (no longer Tier Classified) removed. August: 38 sites added and 60 removed. September: 84 sites added, 39 removed, 1 moved. November: 119 sites removed and 37 added. 2009: In February: 601 sites removed and 208 added. In May: 106 sites removed and 103 added. In December: 121 sites added and 229 sites removed. 2010: In June: 182 sites were removed and 180 were added. 2014: On June 5, 2014 revisions to the Massachusetts Contingency Plan (MCP) were promulgated. In accordance with the amended MCP all formerly classified Tier 1A, Tier 1B and Tier 1C sites were reclassified as Tier I. These changes are reflected in the data published by MassGIS on 9/24/2014. The current data are up-to-date through April 8, 2019. Also see the MassDEP Oil and/or Hazardous Material Sites with Activity and Use Limitations (AUL) Datalayer, which often is updated in conjunction with the 21E sites.